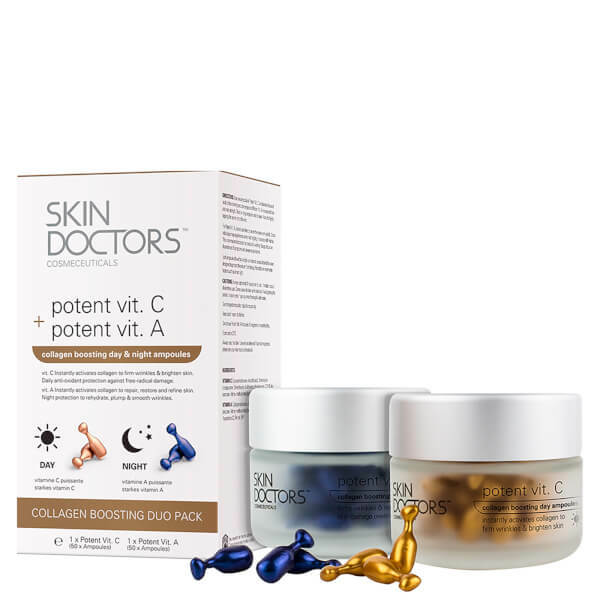 Rediscover skin’s youthful capacity with the Potent Vitamin C & Vitamin A Collagen Boosting Day/Night Ampoules Duo Pack from Skin Doctors. Encapsulating 50 single measure dose ampoules each of Vitamin C and Vitamin A, the two work in synergy around the clock to deeply hydrate skin whilst the antioxidant-packed formula protects skin from harmful aggressors and combats signs of ageing. Consecutive and conjunctive use leaves skin looking younger and revived. A pure, concentrated anti-ageing treatment encapsulated within 50 single measured dose ampoules. 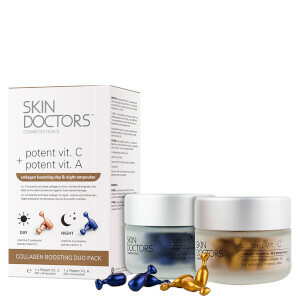 Packaged in air-tight ampoules to protect efficacy, the high-concentration treatment contains a potent form of pure Vitamin C (Ascorbic Acid) at 10% concentration, which delivers hydrating and antioxidant properties to protect skin against environmental aggressors and leave it feeling firmer and looking illuminated. Delivering instant and cumulative effects, each dose will encourage collagen and elastin production whilst fighting the appearance of fine lines and wrinkles to promote a younger-looking, supple complexion. The night-time part of the regime that contains contains 15% pure Retinol and utilises patented Microsponge® slow-release technology, a method which infuses Retinol gently into skin to help minimise irritation. Delivering instant and cumulative effects, each dose will encourage collagen and elastin production whilst repairing, restoring and refining the look of uneven skin tone, sun damage and pigmentation. It also tackles fine lines and wrinkles to promote a younger, smoother-looking complexion. After use, skin witnesses improved hydration and firmness. Vit C: Use one ampoule on cleansed face and neck every morning. Twist or snip ampoule neck to open. Apply by lightly tapping the serum onto the skin. Vit A: Use one ampoule on cleansed face and neck at night. Twist or snip ampoule neck to open. Apply by lightly tapping the serum onto the skin. Do not use directly below the eyes or on eyelids. Some individuals may experience some mild tingling or redness with retinol products. This is normal and indicates the product is working. Usage should be discontinued if symptoms are severe or persistent. Note: Do not use if pregnant or breast feeding. Store both below 25°C. Vit C: Cyclopentasiloxane, Ascorbic acid, Dimethicone Crosspolymer, Dimethiconol, dl-alpha-tocopheryl acetate, C12-15 alkyl benzoate, Methyl methacrylate/glycol dimethacrylate crosspolymer, BHT. Vit A: Cyclopentasiloxane, Dimethicone crosspolymer, C12-15 alkyl benzoate, Methyl methacrylate/glycol dimethacrylate crosspolymer, Polysorbate 20, Retinol, BHT.